When you walk into the field house at Lone Peak High School, you are met with freshly waxed wood floors, bright lights and seemingly endless shields representing state championships and, for that matter, national championships. In case you forget about those, just walk out into the hallway where you see a trophy case that will soon need to be expanded. Yes, there are expectations at Lone Peak, and none of them ask for underachieving, especially at the position of quarterback of the football team. Talmage Gunther is the current occupant of that position at Lone Peak and the senior has thrived. But that wasn’t always the case for the star quarterback of a team that rolled through and undefeated 5A regular season. For most of the summer, it was a toss-up between Gunther and Dakota Hansen, the younger brother of the last quarterback to lead the Knights to a state championship, Chase. The situation could not have come out better. 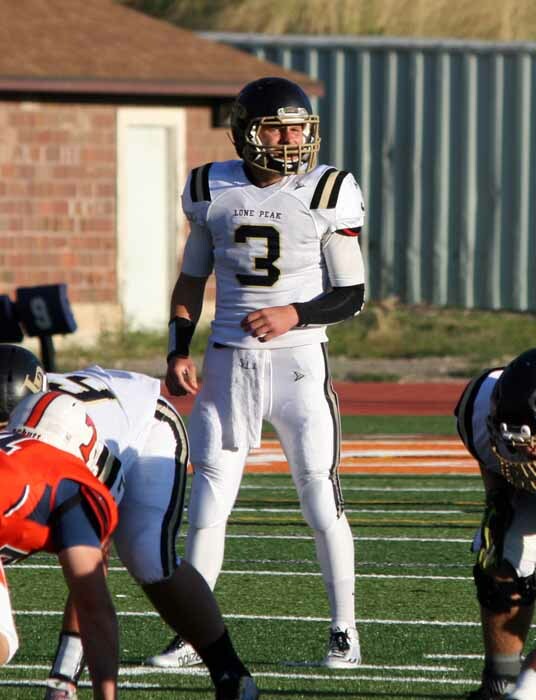 “TG3” has been compared to former Lone Peak quarterbacks Hansen and Baron Gajkowski. Through the team’s win over Roy in the state quarterfinal, Gunther had 1,917 yards passing, 745 yards rushing and 37 total touchdowns while leading one of the most productive offenses in the state. 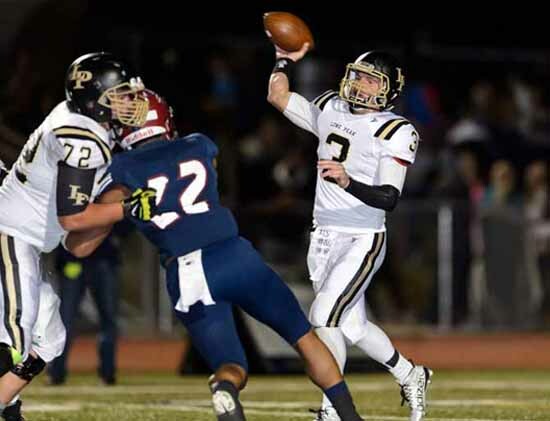 It’s a pace that has Lone Peak in gear to face-off against any team that comes its way in the playoffs. A lot of it has hinged on the play of Gunther, but that’s not necessarily where he gives the credit. That goes to the players around him. Beyond football, Gunther also plays a key role for the nationally prominent Lone Peak basketball team. 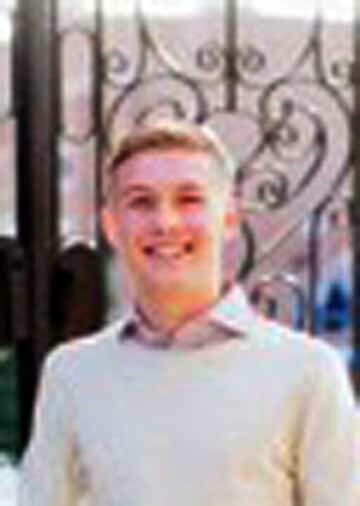 Stacked on top of that, he is enrolled in several AP classes and is a great student, finds time for church and family and is the most team-oriented person you could ever meet. “He really is a team player and there’s no question about it, head coach Mike Mower told The Deseret News. “He wants to do a great job individually, but his desire to do that job is only to help the team as much as possible”. Gunther has a pretty simple process as a team leader. The senior has goals that go beyond the football field or the basketball court. The goal of the high school athlete regardless of sport, position on a team, or school, is the state championship. But the dual-sport athlete wants a lot more out of his high school athletic experience. When asked who he would compare his game to, Gunther went with an NFL quarterback who is making a difference early in his career. Gunther brings both perspective and a selfless attitude to the Lone Peak football team this year. Maybe a lot of that new-found unity has something to do with the attitude Gunther carries in his own values and as a side-effect, it has resulted in a special season. This is a Lone Peak football team to believe in and the Knights have had a special season. It is a group with the talent to live up to all of those expectations that you see Lone Peak teams have. This is a quarterback who pushes his whole team to dominating victories. The Knights will be a tough out in the postseason, and regardless the final outcome, watch the example Talmage Gunther sets as a quarterback and beyond. Lone Peak High senior Tanner White wrote this story as part of the Preps Utah student journalism program.